Today's students (and their parents) are highly motivated by practical considerations: Will they be able to get a job with their degree? How well will it pay? (See the AGI summary of 2013 median salaries in the Geosciences and their 2007 report on starting salaries in the Geosciences to find out.) Will it be satisfying? By informing your students about the full range of career opportunities in the geosciences, you will improve your chances of recruiting majors (e.g. Marketing Earth Science Education, 2002, Hoisch and Bowie, 2010). Here are several ways to do that, with examples from various geoscience departments. One of the recommendations from the October 2007 workshop on Strategies for Successful Recruitment of Geoscience Majors was the active, intentional use of introductory geoscience classes. Several participants spoke of the effectiveness of making a presentation about opportunities within the department's geoscience programs and about career opportunities in geoscience during each introductory course. Below are some examples of such presentations. This presentation (Acrobat (PDF) 2.4MB Dec6 07) shows geoscientists at work in a wide variety of settings, provides salary information, lists some of the primary skills developed in a geoscience program, and describes many of the career opportunities available to students who successfully complete each of the department's degree programs. 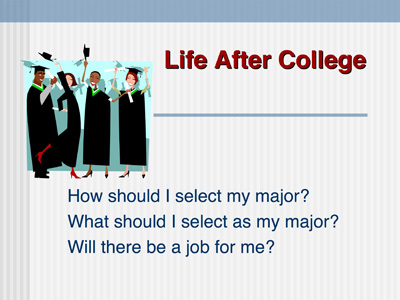 This presentation (Acrobat (PDF) 4MB Dec6 07) focuses on the process of choosing a major and on the wide variety of career opportunities available to people with degrees in geology and geography, including some salary information. It also presents many examples of prominent people with degrees in the geosciences. Finally, it describes why geoscience degrees will be increasingly valuable in the future. Some organizations have produced promotional videos, describing career opportunities in the Earth Sciences. You can show them in your classes or direct interested students to them. The earth sciences are central to all aspects of life. Get a quick glimpse of how in this 6 minute video from AGI. Learn about careers, education, and research in water and environmental engineering from diverse undergraduate and graduate students. See what excites them about their future careers. Learn about what engineers do; observe first hand research projects on cleaning up wastewater and oil spills. Many students (and their parents) are concerned about being able to earn a living with their college degree. Data on geoscience salaries can be persuasive. from the American Geosciences Institute. Despite the lagging U.S. economy, salaries for aggregated geoscience-related occupations increased by 1.1 percent between 2009 and 2010, while aggregated salaries for all life, physical and social science occupations decreased. Salaries for all U.S. occupations only increased by 0.2 percent between 2009 and 2010. In addition to competitive salaries, geoscience occupations are expected to grow by 23 percent between 2008 and 2018, adding just over 60,000 jobs to the U.S. economy. from the American Geosciences Institute. These data show starting salaries for geoscientists with Bachelors, Masters, and PhD degrees and compare them to starting salaries for graduates in other disciplines. from the American Geosciences Institute, July 2009. The percent change of mean annual salaries is also graphed by subdiscipline, and the rates of increase over the past decade are impressive. The Carleton College Geology department maintains a webpage of links to alumni webpages, arranged chronologically by year of graduation. One particularly nice aspect of this list is that it includes many people who have chosen careers outside of geology. The Earth and Oceanographic Science department at Bowdoin College also lists where their recent alumni are now and includes a wide variety of occupations. 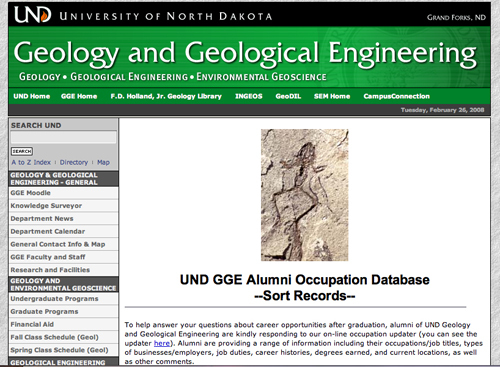 The UND Department of Geology and Geological Engineering has an online alumni occupation database based on information its alums have supplied via an online form. 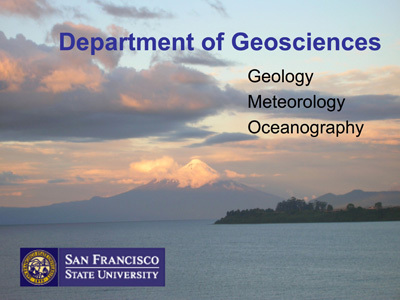 Many geoscience departments have a visiting speaker series; incorporating some talks specifically about geoscience careers is an easy, effective way to promote this information. Your alumni can be an excellent resource for such talks. Several participants in the January 2007 workshop on The Role of Departments in Preparing Future Geoscience Professionals mentioned that Homecoming Week is a good time to invite your alumni to give talks (or be part of an alumni panel), as they may already be planning a trip to campus. 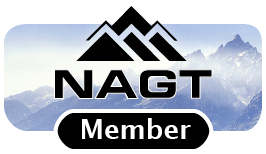 is designed to interest students and introduce them to the geosciences, emphasizing the diversity of career opportunities and positive impacts that geoscientists have on the world. It includes information about what geoscientists do, where they work, and future employment prospects. include a wealth of data from the American Geosciences Institute. Their Status of the Geoscience Workforce 2009 report integrates a variety data sources into a comprehensive view of the human and economic parameters of the geosciences, including supply and training of new students, workforce demographics and employment projections, to trends in geosciences research funding and economic indicators. 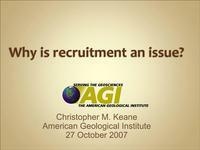 Also see AGI's Geoscience Workforce program page, with links to reports and news. 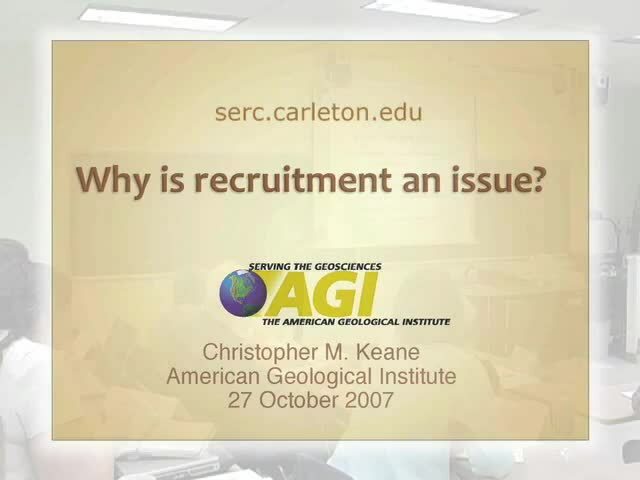 presented data on National Recruitment Trends and Future Drivers (Acrobat (PDF) 844kB Oct28 07) at the 2007 workshop on Strategies for Successful Recruitment of Geoscience Majors. His predictions of career opportunities based on those data are optimistic. feature interviews with geoscience employers and recent hires, geoscience employment data, and profiles of geoscientists in a variety of careers. 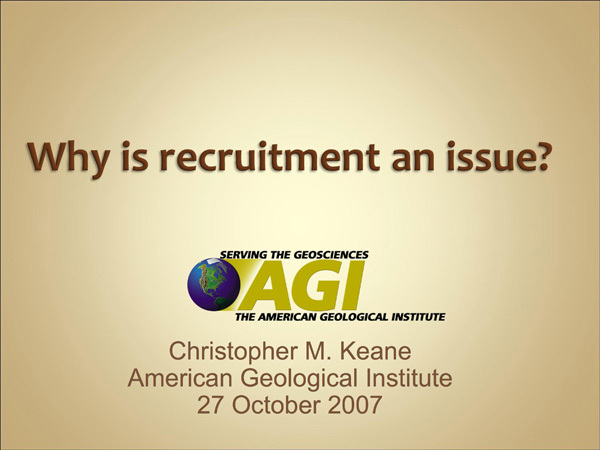 American Geosciences Institute, 2010. Student Perceptions of Geology and Implications for Choosing Among Different Science Majors. This article summarizes the results from interviews of nearly 800 students at Northern Arizona University in 2008-2009. The interviews focused on students' attitudes toward science major programs. The study highlights students' misperceptions about geoscience careers, particularly salary expectations: students significantly underestimate starting salaries for geoscientists. You may also watch AGI's webinar on this topic, in which Dr. Tom Hoisch, one of the authors of the study, discusses their findings. American Geosciences Institute, 2014. 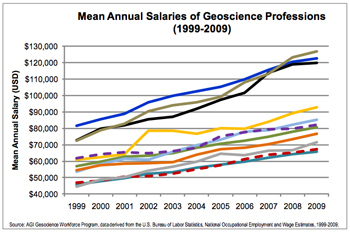 2013 Median Salaries for Geoscience-Related Occupations. This extremely brief article summarizes the 2013 median annual salaries for geoscience-related occupations in the United States, as reported by the U.S. Bureau of Labor Statistics. The authors surveyed 783 students in introductory geology classes and 23 geology majors about what factors would or did influence their choice of majors. 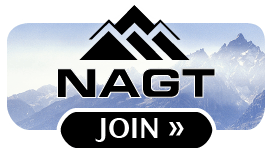 Factors that favor the choice of geology at NAU include employability, good salary potential, the opportunity to work outdoors, and environmentally friendly employment. Students generally underestimated the salary potential of the geosciences; correcting that misperception may encourage their choice of geology as a major. You can listen to Dr. Hoisch describing this study in this AGI's webinar. 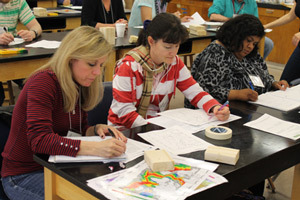 Marketing Earth Science Education, an article from Gaea (the newsletter of the Association of Women Geoscientists), May, 2002, details the results of a study conducted by the Department of Earth Sciences at Utrecht University in the Netherlands. The department had been experiencing a trend of declining enrollments. By altering their recruitment efforts to address student interest in careers, the department was able to reverse the enrollment trend in its classes.